I think it’s fair to say WINTER is finally here! Are you experience more than normal dry skin, due to the brutal cold winds? Last week on the Dr. Oz show he mentioned how important it is to keep your body moisturized during the winter months. He also said showering with hot water will dehydrate the skin. So, turn down the HOT water, and use warm water when bathing and showering. The key to combating dry skin is moisturizing. The first step is to exfoliate to remove the barrier of dead skin cells on the top layer of your skin. Think about it, if you have a pile of dry skin the creams, butters or lotions will not be able to penetrate the skin, which will ultimate increase dryness of your skin. Therefore, this is why exfoliation is very important to include in your skin care regimen. Try to exfoliate at least 2-3 times per week to see results. The next step is to cleanse your skin with a moisturizing soap, preferably soaps made with natural oils and butters (not the commercial bars found in stores). One of my customers shared with me that commercial soap dry out her skin. I recommended for her to use moisturizing soaps as I am recommending the same for you. Finally, after you have exfoliated and cleansed, you must now moisturized your skin. One more tip….Do not forget to drink at least 8-10 glasses of water daily. Water will hydrate your skin as well. If you work out try to drink at least 12-15 glasses of water daily. Here at Natural World Essentials, it is our mission to offer a healthier alternative to commercial skin care products; and, thus we have the perfect solutions for you. Our 100% Organic Cocoa Butter and 100% Unrefined Raw Shea Butter will moisturize and hydrate your dry skin. And, wouldn't you know it....this is your lucky day because we are having a S-A-L-E on these items. This week ONLY, beginning today thru Saturday, Dec. 17th, you can purchase our solid butters for just $15. Use Coupon Code: SB2011 at checkout to receive the discount. Also, checkout our body scrubs to exfoliate and our moisturizing handmade soaps to cleanse. Click HERE to order NOW! Combine the sugar into a bowl along with the Sunflower and Jojoba oils. Then add the Peppermint Essential Oil and Vitamin E and stir. Apply to lips and massage in a circular motion to remove any dry skin. You can also use a toothbrush to exfoliate your lips. Rinse with warm water and apply a lip moisturizer immediately to keep your lips moisturized. Please try to use natural oils or butters, such as cocoa butter or shea butter. 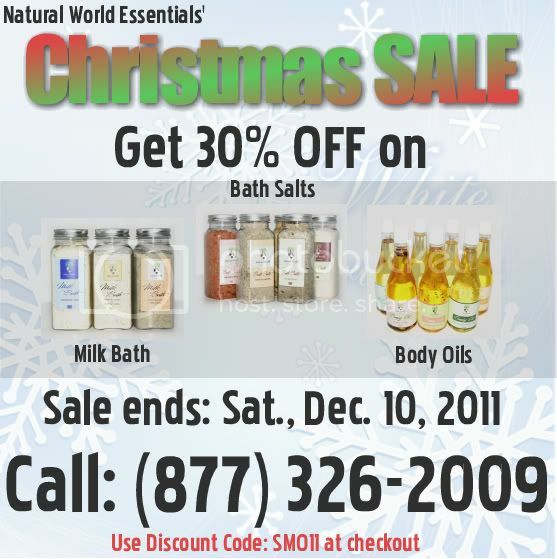 Natural World Essentials is having a Christmas Sale! Hurry, though; sale ends Saturday, December 10, 2011 (not 12th as the ad indicates). Visit us online @ www.NaturalWorldEssentials.com or call us @ (877) 326-2009. Let’s talk about our skin! Did you know your skin is the LARGEST organ of your body? Yep, so everything you are putting onto your skin is absorbed in your bloodstream. All the chemicals found in commercial soaps, body wash, lotions, creams, face and body moisturizers, hair products, make-up removers, lipsticks and even the products used to clean your home are all absorbed into your bloodstream. You see, the body cannot breakdown chemicals because they are not made to be digested by the body. Ultimately, this causes health issues or ailments for many people due to chemical buildup in the body. On the other hand, when using natural plant based ingredients, the body naturally pulls all nutrients and benefits from the ingredients, which the body can easily breakdown because this is what the body is designed to do. So, in simple terms, natural plant based ingredients are created for your skin. Parabens are a group of chemicals used to extend shelf life and due to its low cost is why most commercial companies use them to preserve products. Unfortunately, these chemicals are all linked to CANCER. Propylene Glycol is an industrial anti-freeze and the major ingredient in brake and hydraulic fluid. According to Material Safety Data Sheets (MSDS) on Propylene Glycol warn to avoid skin contact as it is systemic and can cause liver abnormalities and kidney damage. Petroleum/Mineral Oil (by product of gas) comes from crude oil used in the industry as metal cutting fluid. This chemical may suffocate the skin by forming an oil film (clogging your pores). Healthy skin needs to take in oxygen and release carbon dioxide. Sodium Lauryl Sulfate (SLS) and Sodium Laureth Sulfate (SLE) are surfactant/detergent cleansing agent, which cause irritations to the skin. The question lately has been “Why is there a high increase in CANCER”…well think about the chemicals you are putting onto your skin and ultimately entering your bloodstream! Don’t take my word for it…please do your own make up research on harmful chemicals in products you are using and the harm they are causing. If you're ready to break away from using chemical based skincare products, then we invite you to visit us on the web at www.NaturalWorldEssentials.com or call us at (877) 326-2009. We offer a complete line of natural bath and body skincare products that are all made with pure, wholesome ingredients found in your very own kitchen. Welcome to Natural World Essentials first BLOG POST….YAY! I would first like to introduce myself, I am Nickola Jones the Founder of Natural World Essentials. I founded this company in a desperate need of a nature based solution for my daughter’s eczema. My daughter, who will be 3 yrs old in October, was diagnosed at the age of seven months with eczema, and I was given a prescription by her pediatrician to treat her condition. However, I did not feel comfortable with putting the chemicals of the prescription onto my baby’s skin. So, I decided to research “natural remedies for eczema”, and found a wealth of great information on how to naturally treat this skin condition and my journey had began. During my research, I found articles and information on how to make handmade soap, body butter, body wash, body oil and Natural World Essentials was born. Here at Natural World Essentials, we specialize in handmade bath and bodycare products for all skin types using TRULY organic and natural ingredients. The following are some of the ingredients found in our products: herbs and botanicals, unrefined raw shea butter, organic virgin coconut oil, organic cocoa butter, extra virgin olive oil, kukui nut oil, avocado butter, mango butter, essentials of lemon, grapefruit, rosemary, lavender and lemongrass just to name a few. We have seven collections within our product line, which you will find when you visit us online. For those of you that suffer from eczema, or have very sensitive skin, please check out the “Eczema & Psoriasis Soother” and “Unscented Natures” collections. If you haven't already done so, become a Fan on Facebook by clicking the “LIKE” button on our Natural World Essential's page or follow us on Twitter @NatWorldEssent. Also, we are available for booking NWE Spa parties. When YOU host a N.W.E. SPA Party, the hostess will receive FREE gifts. For more information, please visit us at www.naturalworldessentials.com. Please don't keep us a SECRET, please share with family and friends! Handmade Natural Bath & Body products such as soap, body butter, bath bomb, body scrub, body wash and body oil. Hair care products such as oil and hair butter.